Goltens was contracted by a large cruise vessel owner to undertake the installation of two exhaust gas scrubbers on one of its ships to comply with sulfur emissions regulations. The vessel is powered by four GMT/Sulzer 16ZAV40S and two GMT/Sulzer 12ZAV40S diesel electric generating sets. The project involved the evaluation, planning, design and installation of two 10+ meter long exhaust gas scrubber towers on Diesel Generators #1 and #2 with a deadline to complete the operation before the end of the vessel’s dry dock period in a U.S. port. First, technical specialists inspected the ship to evaluate the project, determine space requirements and record any logistical obstacles. In addition, 3D laser scanning of the spaces for the scrubbers was undertaken to facilitate system modelling. 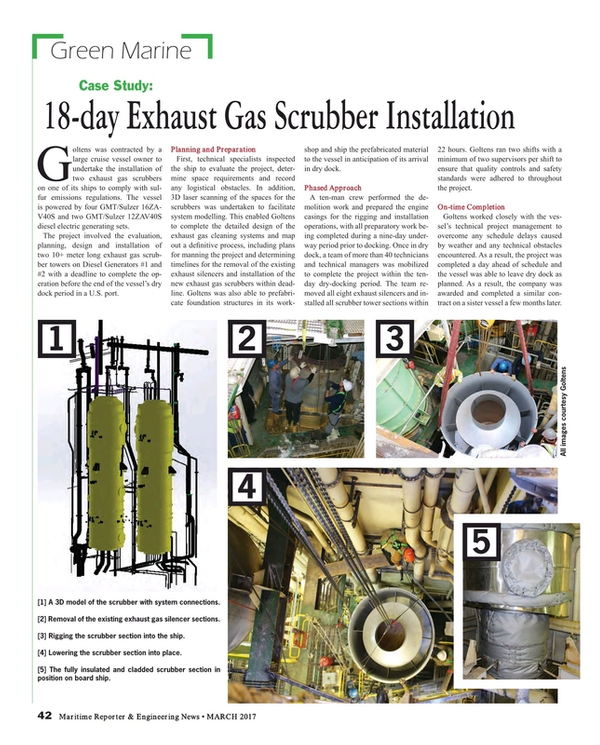 This enabled Goltens to complete the detailed design of the exhaust gas cleaning systems and map out a definitive process, including plans for manning the project and determining timelines for the removal of the existing exhaust silencers and installation of the new exhaust gas scrubbers within deadline. Goltens was also able to prefabricate foundation structures in its workshop and ship the prefabricated material to the vessel in anticipation of its arrival in dry dock. A ten-man crew performed the demolition work and prepared the engine casings for the rigging and installation operations, with all preparatory work being completed during a nine-day underway period prior to docking. Once in dry dock, a team of more than 40 technicians and technical managers was mobilized to complete the project within the ten-day dry-docking period. The team removed all eight exhaust silencers and installed all scrubber tower sections within 22 hours. Goltens ran two shifts with a minimum of two supervisors per shift to ensure that quality controls and safety standards were adhered to throughout the project. Goltens worked closely with the vessel’s technical project management to overcome any schedule delays caused by weather and any technical obstacles encountered. As a result, the project was completed a day ahead of schedule and the vessel was able to leave dry dock as planned. As a result, the company was awarded and completed a similar contract on a sister vessel a few months later.